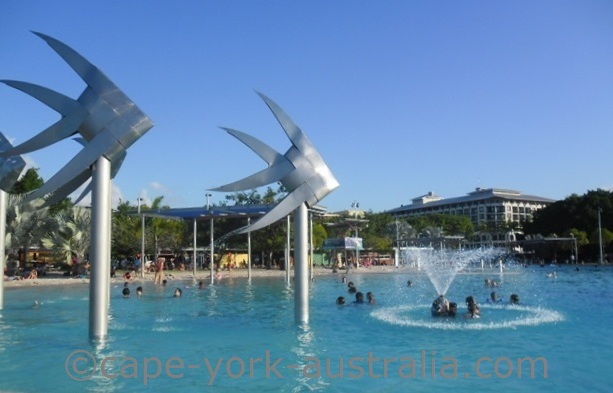 It is tropical monsoonal climate in Cairns Australia. 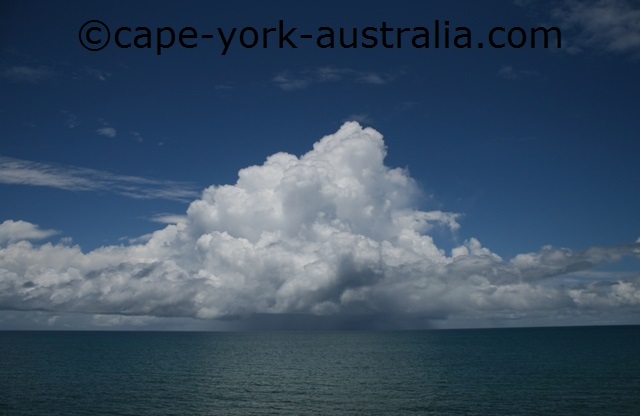 It is similar to the climate in the whole Cape York (which I explained a bit further on the northern Australian climate page), except it rains more in Cairns. 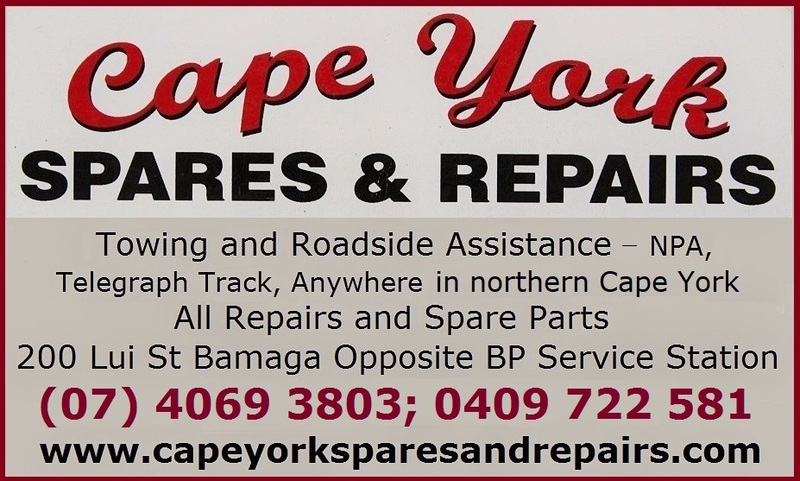 As opposed to the places in southern parts of Australia, up here we have two seasons - the Wet (when it is summer in southern Australia and winter in the Northern Hemisphere), and the Dry (when it is winter in southern Australia and summer in the Northern Hemisphere). 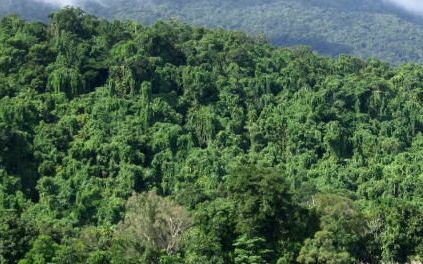 The Dry season has sunny weather, clear skies and cool temperatures (usually about 20-25 degrees Celsius) - perfect temperature. But this does not mean that it never rains. We can still get a bit of rain, and actually in later years it has increased to the point where we really don't have a proper Dry season anymore. (As elsewhere in the world, the climate has changed lately and it is not impossible that it is due to global warming). 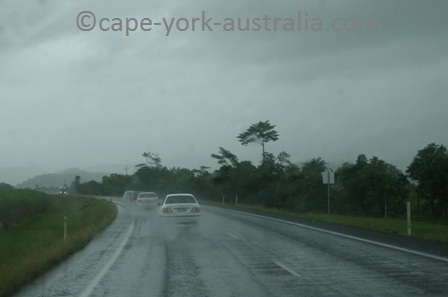 The Wet season has at least two distinctive stages in it - the Early Wet, and the Late Wet. The Early Wet stats gradually some time in November, and is also known as the "Troppo" Season (meaning people go crazy from the tropical heat). 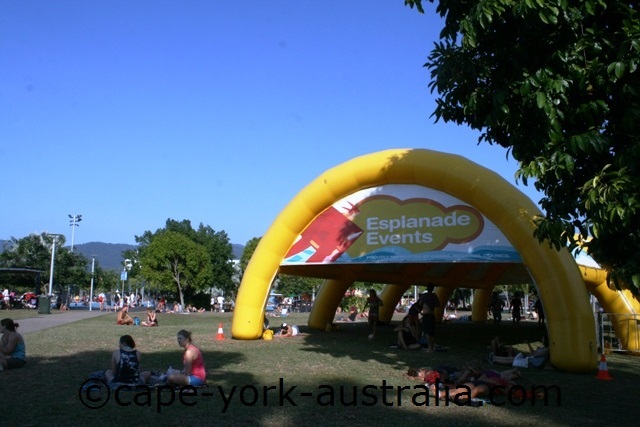 It is the build-up to the 'real' Wet, and the temperatures gradually increase through 30s into the 40s, and in combination with the tropical humidity (southern Australia can also get such summer temperatures but not for as long periods as up here, and they don't have the humidity) create a weather that sends everyone mad. The heat builds up from the mornings until about midday, when it is so hot that it creates huge thunderstorms, so the afternoons see lightening, thundering and heavy rain. 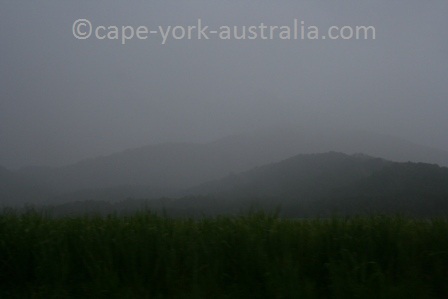 Early wet season tropical strom, Cairns Northern Beaches. This cools the temperature down, so by the evening the storms calm down, the skies go clear, and the following morning the sun is out, heats the weather up again, and everything repeats itself. 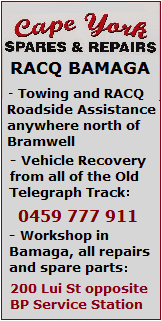 Some time January (can occasionally vary from December to February) this changes when the real moonsoon season starts. 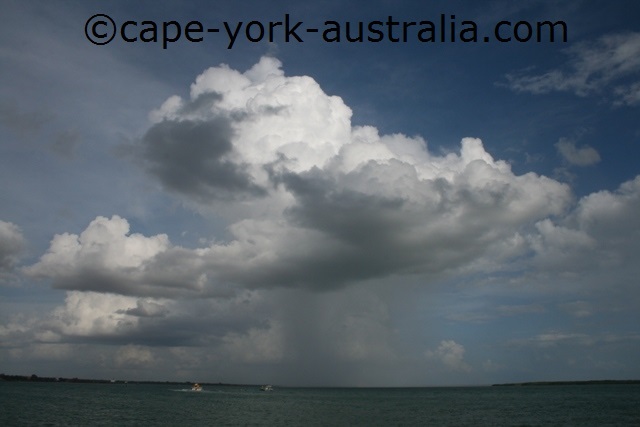 Monsoonal rains move seasonally between the north and the south of the Equator. When we have the Dry season, they are up in South East Asia, and when we have the Wet Season they come down here. 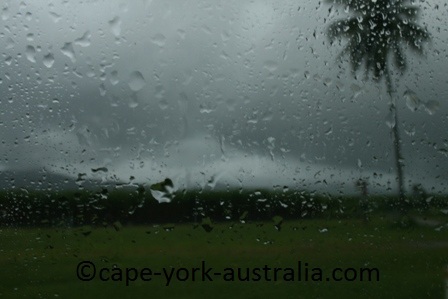 When those rains roll in, you know that the Wet Season indeed has a very appropriate name. It is not hot anymore, but it definitely is wet. It is raining a lot, and when it's not, the skies are still mostly overcast. There is no sun to heat up the weather, and no thunderstorms. There may be some brighter days in between, but in most days it is raining. 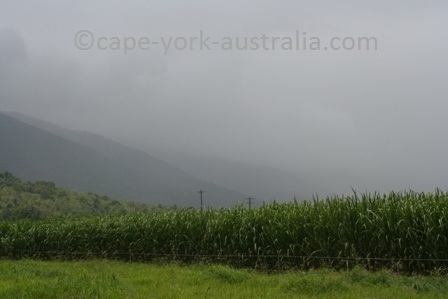 Late wet season rain just south of Cairns. Only one thing can bring some change and that's when a tropical cyclone comes along. 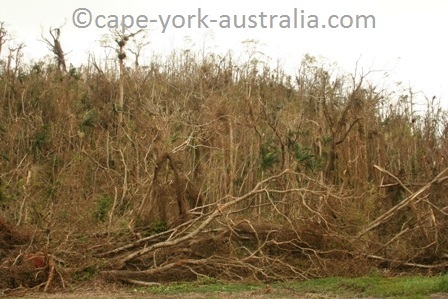 Cairns has had many over the years, and while the last bigger ones were Cyclone Larry (March 2006) and Cyclone Yasi (February 2011, both category 5), we had Cyclone Ita last year (2014), and there are many smaller cyclones many times a year. They may not cause just as much damage and news headlines, but they are still violent wind systems that are potentially dangerous. 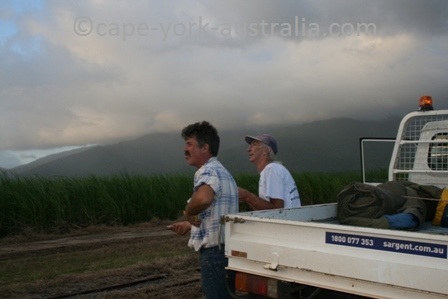 You only need to have a look at the photos of tropical rainforest south of Cairns before and after Cyclone Larry.